465-890 Dr. Jeannette Graf, M.D. Everybody needs somebody to love, so why not show some love for your body with this luxurious kit. Cleanse, exfoliate and moisturize with rich formulas that leave your skin looking smooth and radiant. Who doesn't love that? 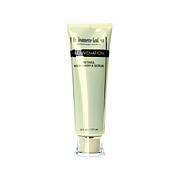 Ingredients: Water, Cyclomethicone, Isopropyl Palmitate, Shea Butter, Glyceryl Monostearate SE, PEG 100 Stearate, Stearic Acid, Glycerin, Cyclomethicone, Dimethicone, Retinol, Cetyl Alcohol, Stearyl Alcohol, Triethanolamine, Imidazolidinyl Urea, Methylparaben, Acrylates/C10-30 Alkyl Acrylates Crosspolymer, Propylparaben, Chamomile Extract, Green Tea. Ingredients: Deionized Water, Sodium Laureth Sulfate, Cocamidopropyl Betaine, Cocamide DEA, Polyethylene, Acrylates/C10-30 Alkyl Acrylates Crosspolymer, Retinol, Triethanolamine, Fragrance, Glycerin, Aloe Barbadensis Leaf Juice, Maltodextrin, Phenoxyethanol, Benzyl Alcohol, Potassium Sorbate, Tocopherol, DMDM Hydantoin, Iodopropynyl Butylcarbamate, Althea Officinalis (Marshmallow) Extract, Arnica Montana Flower Extract, Cucumis Sativus (Cucumber) Fruit Extract, Sambucus Nigra Flower Extract, Hedera Helix (Ivy) Extract, Parietaria Officinalis Extract, Rosemary Extract, Methylchloroisothiazolinone, Methylisothiazolinone, Yellow 5, Blue 1. Ingredients: Water, Olea Europaea (Olive) Oil, Methyl Gluceth 20, Cetyl Alcohol, Glyceryl Stearate, Stearic Acid, PEG-100 Stearate, Ascorbic Acid, Tocopherol, Dimethicone, Hamamelis Virginiana (Witch Hazel), Pantothenic Acid, Glycerin, Caprylic/Capric Triglyceride, Rosmarinus Officinalis (Rosemary) Extract, Propylene Glycol, Chamomilla Recutita (Matricaria) Extract, Arachis Hypogea (Peanut) Oil, Daucus Carota Sativa (Carrot) Extract, Isopropyl Myristate, Hydrolyzed Wheat Protein, Keratin Amino Acids, Cocodimonium Hydroxypropyl Hydrolyzed Wheat Protein, Wheat Amino Acids, Keratin, Retinol, Althea Officinalis (Marshmallow) Extract, Hedera Helix (Ivy) Extract, Anacyclus Pyrethrum Extract, Cucumis Sativus (Cucumber) Extract, Arnica Montana Extract, Aloe Barbadensis Extract, Yeast Extract, Polyquaternium 10, EDTA, BHT, Urea, Methylparaben, Propylparaben, Citric Acid, Fragrance. One of my besties raved about how soft it made her skin feel and she let me try some. It does just that! 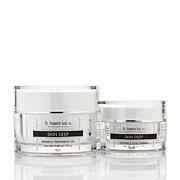 My skin feels smooth, moisturized and soft, instead of itchy and dry. The scent is light and clean smelling, not overpowering. The hand cream feels great because it's not overly oily or silicone feeling. 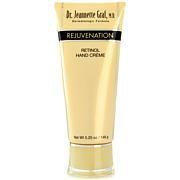 I can't wait to see how the retinol will work on the appearance of my hands over time! The body scrub feels great, but the scent is tolerable for me. This is an excellent price for the trio. I'm almost finished with the body butter and about to place a second order. However I'm strongly considering autoship for the winter months to prep my skin for the spring and summer months! These body butter products are just awesome! They make your skin feel good not oily/greasy and no overpowering making you gag odor either. I love this product and have just purchase some additional body butter. I highly recommend this product to anyone that's looking for a product that actually works. And stay away from the so-called awful smelling Korres Body Butter products. 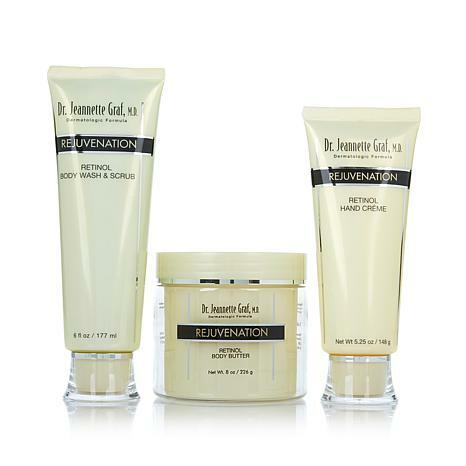 I love these treatment products! They work and smell wonderful. 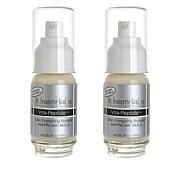 Luxurious and effective on dryness and dullness and that dreaded cracked skin look. The value is fantastic. The body wash smells so great. If there was a cologne that smelled like this I would bye it! Body butter too, and I am using it as a hand cream too. Great price. I want more hand cream. The Body Butter is my favorite of all. It goes into the skin easily so you can get dressed quickly after use.The shower gel is good as is the hand cream.